eat-sleep-knit: Wednesday? No, It's Monday! Well, I said I would post about my cookie baking adventures on Monday... it's now Wedne.. No it's Monday (you are getting very sleepy). Once again, my posting time kept getting filled with errands, movies, appointments, and all that hoo-hah. I can't wait until this weekend: Just me, Mr.V, christmas dinner and dessert, and a some knitting. Lots of knitting. I haven't even cast on for Kate (from knitty) yet. Hourglass is inching along, and I think I'm getting the stockinette-blues. I need some moss stitch, RIBBING, YO's, SOMETHING. Really, it's not that bad. But I'm not projecting that I'll be finishing Hourglass anytime soon. So, Mr. V and I are out and about again tonight for some last minute shopping. We'll be splitting up. Mr. V to Joann's. Me to Target. Hmm... I wonder what santa will get me? Those bags are cute! I always wait until Dec 26, then I go out and stock up on all the Christmas junk that didn't get sold and is then 80% off and stuff. The gift bags are darling. Such a cute idea for your coworkers. 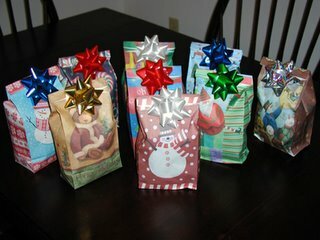 I haven't even finished shopping for my family, so I guess my coworkers aren't getting anything! So cute with the cookies in the gift bags! I wish I had time for something like that, but unfortunately packing and moving doesn't exactly allow for a whole heck of a lot of time. Enjoy your Christmas!